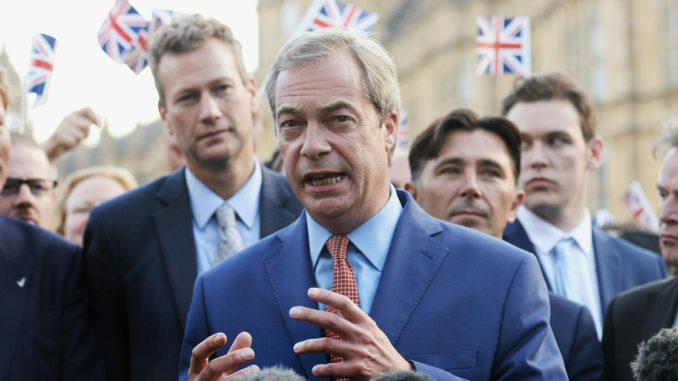 Donald Trump’s support of Brexit poses a real threat to the New World Order elites of Europe, according to British politician Nigel Farage. Speaking with Breitbart News, Farage said that the EU is attempting to start a new Cold War with America in order to topple Trump and thwart the will of the British people. Breitbart.com reports: “President Trump is a believer in Brexit because President Trump believes in nation-states, he believes in democracy, not in global bureaucracy, so he’s always wanted Brexit to happen,” he said. “One of the things Trump always wanted to do from day one is to show that world that [just] because he believes in America First, because he believes that some trade relationships around the world are unfair, it doesn’t mean he wants to close America off from he rest of the world — he’s for trade deals if it’s with countries that don’t undercut,” he added — explaining that this is why the President does not like Theresa May’s proposed “worst deal in history” with the EU, which would effectively prevent Britain from signing a trade agreement with the U.S. The MEP added that the EU is, in fact, starting a kind of Cold War with the United States, firstly in terms of trade, but “more than that, deeper than that, and more worrying than that” it also has ambitions to supplant NATO with its own unified military and usurp the Atlantic alliance. “What they’re saying is, we don’t like America, we don’t like Trump, we’re trying to break down all these things that have existed for so long — and frankly, it is an act of the most extraordinary ingratitude. “I’ve said in the European Parliament in the last few months that maybe what we ought to do is to say to oursleves, ‘If it wasn’t for America we’d all be speaking German and we wouldn’t be free countries’, he added bluntly. Asked by Jerome about his recently revealed plans to launch a new party to fight a second referendum, Farage explained why he felt such preparations may be necessary. “In essence, the people had a vote, [and] despite being threatened by everybody and told it would be terrible for us economically and everything else, [decided] we were big enough and ugly enough to say, ‘Do you know what? We want to be free. We want Brexit’,” he said. “The difficulty is, Parliament just doesn’t accept that, still, and that’s why two years and nine months on we’re still struggling with this,” he continued, describing how this has left the country facing a choice between Theresa May’s “dreadful” deal or leaving with no deal, which would mean trading under World Trade Organization terms. “That’s the basis at the moment that we trade with America and China — there’s nothing to be scared of, but of course the globalists are telling us that would be awful,” he explained, adding that this was in fact his favored scenario, and dismissing threats of short-term disruption as overblown. “My fear is that the establishment just do not respect the result, and they’re going to do their damnedest to make us vote again, which seems extraordinary, but it could come to that,” he said — and indeed, other EU member-states such as Denmark and the Republic of Ireland have been forced to vote again after rejecting treaties handing Brussels more powers of national capitals. “What I’m doing is I’m preparing for every eventuality. It would be criminality of me to pretend there’s no prospect of a second referendum so I’m getting ready, and I’m rebuilding the People’s Army — and do you know something? If they take me on again, it’ll be no more Mr Nice Guy from me,” he grinned.